Parasyte -the maxim- has landed! The long awaited horror series is our latest acquisition, and you can catch the first 12 episodes for FREE RIGHT NOW on hulu! 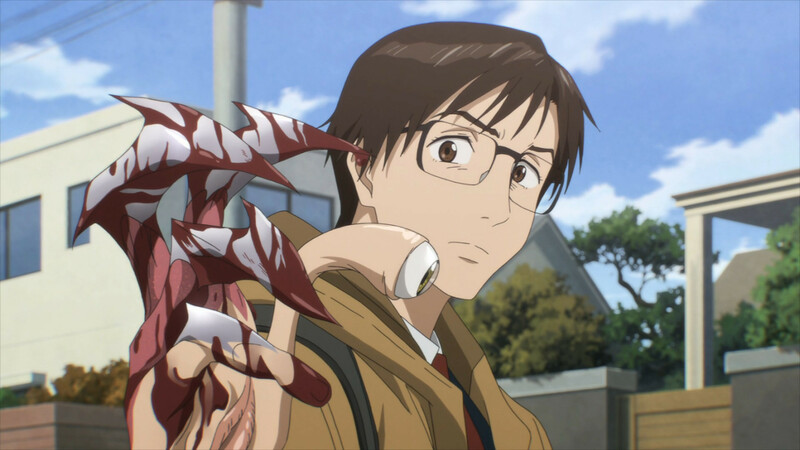 The invasion has begun as Sentai Filmworks announces its acquisition of North American, South American, UK, Australian, and New Zealand rights to the highly acclaimed series PARASYTE –the maxim-. Animated by MADHOUSE, directed by Kenichi Shimizu, and broadcasted by Nippon TV in Japan, this adaptation of the groundbreaking horror manga by Hitoshi Iwaaki is brought to life in the most gruesome way imaginable. Unbeknownst to mankind the world is quietly being invaded. Alien beings known as “Parasytes” begin infiltrating humans one by one, burrowing into their brains to take complete control of both their bodies and their identities. With an insatiable hunger for human flesh these cold and calculating creatures mutate into grotesque monsters who feed on the unsuspecting when they’re not hiding behind the faces of everyday people. Only Shinichi Izumi, a lone high school boy, is aware of the terror lurking in plain sight. After one Parasyte’s attempt to take over his brain ends in failure, Shinichi’s right arm is instead possessed by this monster with a mind and an agenda all its own. As Shinichi and his unwanted cohabitant, “Migi,” struggle for dominance of his body, the alien infection continues to grow and so does the trail of bodies in its wake. Now Shinichi and Migi must become more than host and parasite if they hope to not only protect themselves, but Shinichi’s loved ones as well. As Shinichi and Migi’s symbiotic bond deepens, will Shinichi be able to hold on to his humanity, or will he evolve into something more than he ever imagined? Sentai Filmworks curates one of the world’s largest and most beloved Anime and genre programming libraries, containing thousands of hours of content released across traditional and digital media platforms. Boasting hit series that include Clannad, Girls und Panzer, High School of the Dead, and Infinite Stratos, Sentai’s catalogue continues to grow with new favorites such as No Game No Life, Log Horizon, Beyond the Boundary and Akame ga Kill! Visit www.sentaifilmworks.com for more information. Nippon Television Network Corporation (Nippon TV) is Japan’s number one rated broadcaster, having won the Triple Crown title for the entire year of 2014 by topping the charts in the All Day, Prime Time, and Golden Time categories. Since becoming Japan’s first commercial broadcaster in August 1953, Nippon TV has come to be known as the country’s finest producer and broadcaster of all genres of programs ranging from news, documentaries, sports, dramas, entertainment shows to animation. One of the biggest successes for Nippon TV is its format Dragons’ Den. To date, the format has been sold in 27 countries. Nippon TV also has a wide variety of group companies that deal with movies, animation, events, TV shopping, and merchandising.